After taking my first bite of this homemade pho by Lily's mom, I turned to Anh and said..."that's it, I can't eat any other pho." When people say, "oh this was made with love..." yeah, I totally tasted love in this bowl of pho and also time and also mad skills. I finished the whole bowl and drank all the broth. Super deep flavors that I have never tasted in any pho I have had in NYC. We were lucky enough to get invited by Sydney to join her at her friend's mom's pho pop-up at Ramen Lab. This really got me thinking about what I consider to be good and authentic. I have never been to Vietnam but definitely ate enough pho while growing up in LA. My family and I would drive to Westminster aka Little Saigon for our fill of Vietnamese food. After moving to NYC, it's rare to drive to Little Saigon when I'm visiting home. (I guess I should do that next time when I'm in LA.) When I was a kid, I didn't doubt the pho that I was eating wasn't authentic. Actually, I didn't know much about food until I moved to NYC in 2003. I went on a food journey when I first moved here, trying to find good pho. Pho that reminded me of LA and not Vietnam. What does it mean to be authentic? Or traditional? 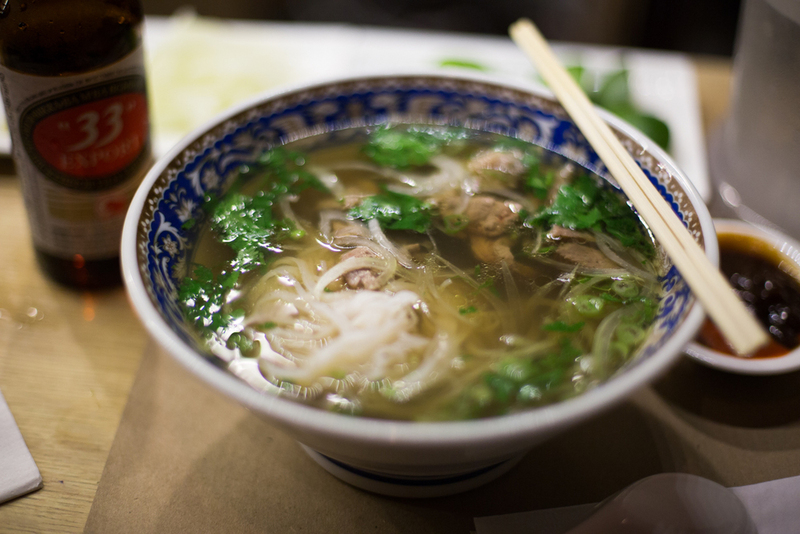 And this isn't just about pho but almost every foods in every century, time and space, there are different variations. People grow up with different experiences and tastes which will affect the way they cook. Maybe the base is the same but with different hands mean different outcomes. Now that I'm writing this (Hi! I didn't think about writing this. I'm more or less just letting my words spill out. ), I guess I have never really searched for authenticity but I was searching for home or my life in LA. Nostalgia? Probably. Every time I eat a taco, I think about all the $1 street tacos in LA. When I eat Hainam chicken rice, I think about the version I had in LA. This bowl of pho I had on Monday is like the true meaning of being home. It was made by someone's mom that really put care into it and maybe because I was eating in a crowded restaurant with mostly their family friends.